It is the smirk that haunts me. The story of Nathan Phillips, the Vietnam veteran and Omaha elder who chose to stand between a group of students from Covington Catholic School and a group of Black Israelites to try to defuse the tension between them during a confrontation and who then became the focus of harassment from the Catholic boys school, has gone viral. He deliberately put himself in harm’s way, only to be surrounded by a group of young men who had ironically just completed a “March for Life.” They blocked Phillips, mocked him and threatened him and the small group with him who were part of the Indigenous People’s March. 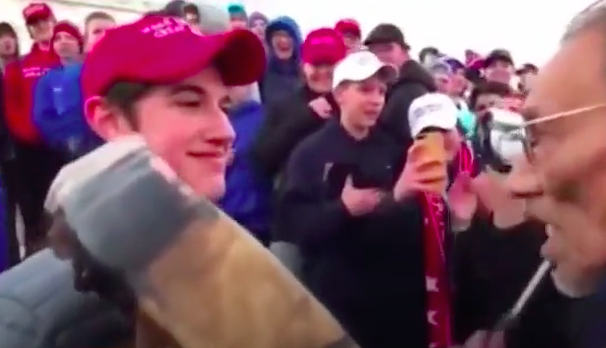 The various videos I watched displayed so many disturbing things — the young men doing the tomahawk chop, laughing as they demeaned his prayers by faking their own “warrior chant” and displaying utter ignorance as they shouted, “Build a Wall” at a group of indigenous people, all while their parents and chaperones stand by and watch, doing nothing. That smirk, that feeling of superiority for no discernable reason other than he clearly thinks he is better than this veteran who fought for his country because he is a privileged white boy, out in the open for all the world to see and with no repercussions from his chaperones who were standing nearby, is what haunts me. It is what most scares me about the current administration and what it represents. I am nobody’s fool. I know that racism and bigotry have always been present. They didn’t disappear when the new millennium began. But over the years, it became less and less acceptable to voice them. People who were openly racist, mocked disabled people, called nations “shithole countries,” compared an entire group of people to vermin or saw the side of white nationalists and Nazis as having “good people” were shunned. Those views were repudiated. However, now, they are publicly being embraced with boldness by people who a few years ago would have had enough shame to keep these abhorrent beliefs to themselves. I’ve seen it unfold on social media. There are people who put things on Facebook and Twitter, people I know personally, who a couple of years ago would have kept their bigotry quiet. They may have thought it, but they knew better than to speak it out loud because they knew, deep down, somewhere inside of themselves, that it was wrong. This isn’t about “political correctness.” It is about common decency, respect and polite behavior. One of my guiding principles as a parent, person and pastor is “you promote what you permit.” In other words, if you don’t take a stand when something is wrong, you are saying it is OK. And that is what has happened to our nation in the past two years. We have permitted this kind of behavior from our elected leader, so it is embraced publicly by his followers as acceptable. We were hardly a halcyonic paradise before his election, as evidenced by the kind of racism surrounding the birther issues and other similar unfounded accusations President Obama faced, but at least those kinds of things were pushed to the margins — extremists without any credibility who embraced conspiracy theories. But like cockroaches who crawl out of their hiding places when the lights go off, the darkness in our nation right now has brought this kind of hatred to the mainstream. It has become acceptable to display disrespect and hatred publicly, allowing a group of smug students to follow a “March for LIfe” with the taunting an elder after his March for Indigenous People, without even fathoming the irony. After the 2016 election, I wrote a blog in which I said I knew people who voted for Trump who I did not believe supported his racist and xenophobic rhetoric, his misogyny, his crude discourse and hate speech. I knew that there were people who voted for him simply because, in their mind, for a host of reasons — often related to the Supreme Court— they felt they had no choice. I said that while I didn’t agree with that choice, in order to move forward as a nation, I understood that it was more than just support of Donald Trump that led them to cast their vote and that we needed to rise to the challenge ahead of us as a nation. Looking back, it was a naive and optimistic blog filled with the hope that elected leaders in his own party would stand up to him and demand that he respond to our better angels and lead with dignity. But here we are, two years after his inauguration, and the situation has gotten worse. Instead of standing up and speaking out, too many of those who cast their vote because of what they said were their “values” have rejected those very values in the name of political expediency and normalized the lies, the cruelty and bigotry. This may not be who we are as a nation, but this is the sad, smirking face of what America has become. So again, I plead to all who have any modicum of decency within you, who care about justice, who love mercy and who want to people of good will, regardless of your political agenda, don’t ignore what is transpiring in our nation. We have permitted this to happen. And the only way we can change it is if everyone who has any sense of goodness, kindness or morality says, “Enough is enough.” We can’t let our sense of outrage grow numb because it has become the norm. We need to quit looking the other way and tolerating it from any elected leader, as we remember our core values, which transcend political views. Otherwise, we are promoting this kind of behavior that results from callous words and cruel actions. It is by standing up, speaking up, showing up and demanding better that we can send the cockroaches of bigotry, misogyny, homophobia and hatred back to the dark places where shame keeps them from rearing their ugly head. Only then will we be able to wipe that smirk off the ignorant hatred that has become the face of our nation.